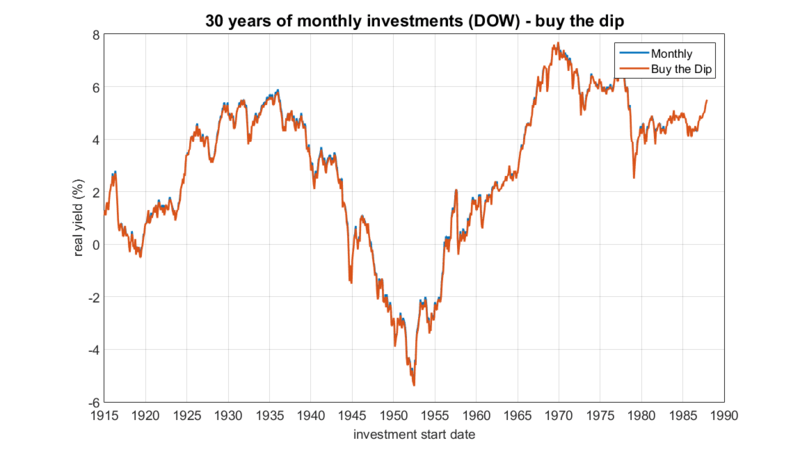 What Are The Actual Yields From Investing In The Dow (DJIA)? 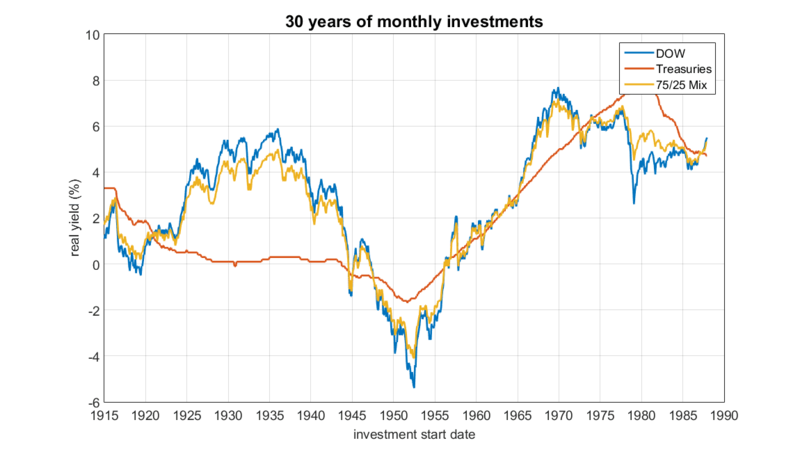 What sorts of real returns did US investors get throughout history? How am I calculating real yield? As a simple example...if you have an investment that triples in 20 years, t = 20, FV/PV = 3, and plugging into a calculator gives you an r of ~5.6%. If inflation in that period means it takes $2 now to buy what used to take $1, then t = 20 and FV/PV = 2 which means r = ~3.5%. If inflation is 3.5% and raw yield is 5.5%, then real yield (adjusted for inflation) is 1 + 5.5% divided by 1 + 3.5%, or (1.055/1.035), or ~1.9%. Another way of thinking of it is that real yield is the increase in actual purchasing power. In the example above, your 5.5% yield gave you enough money to buy 1.9% more things. 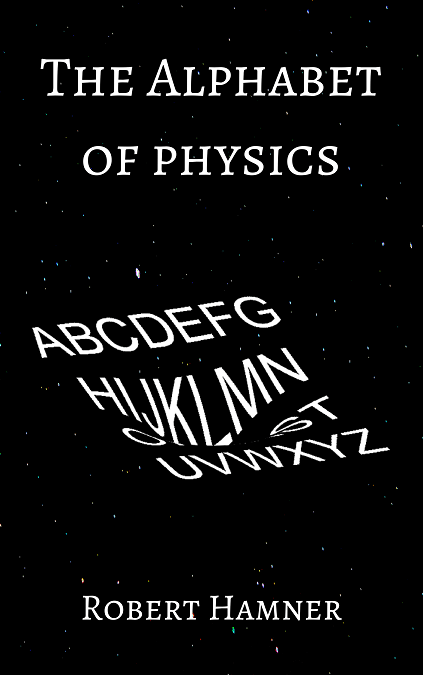 If you want to read more about it, I've written about it previously. I pulled historical Dow and CPI (inflation) values from here and treasury yields from here. The explicit CPI data can be found here. 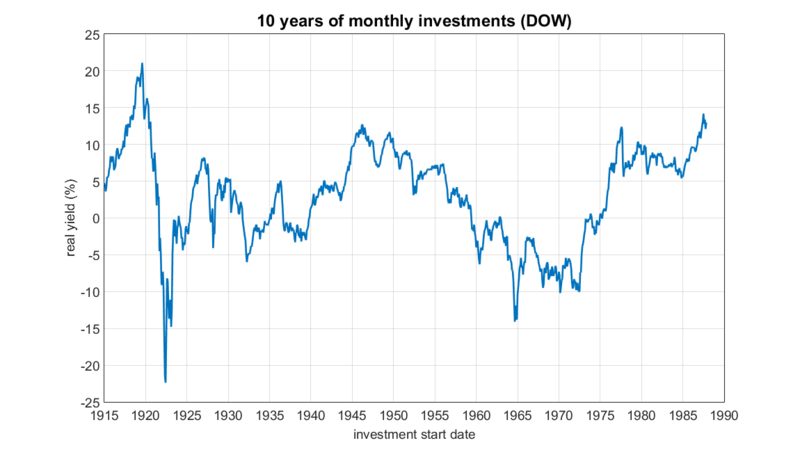 For growth with Dow, I used the month to month change for the value of the Dow. 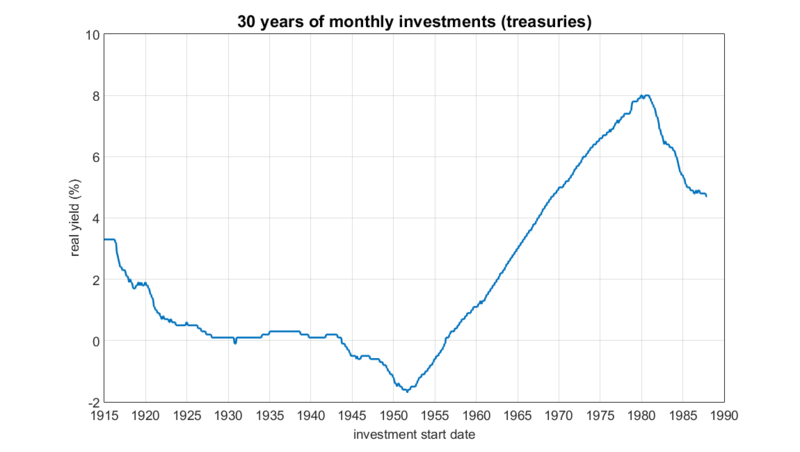 For treasuries, I used the stated yield since the growth rate is fixed at purchase. For inflation, I compared the effective dollar value between the two months. As a note, this is mathematically equivalent to correcting the Dow for inflation as the source I listed provides, but treasuries don't work that way with this set so it's worth explaining. 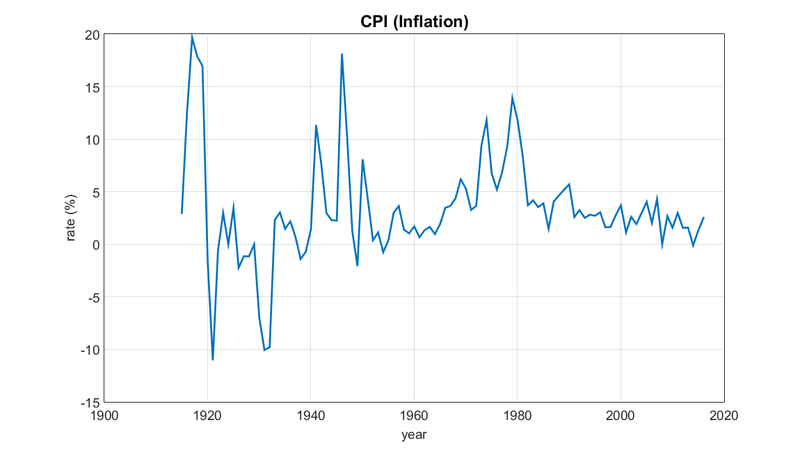 So yeah...inflation was really high during a number of periods in our history, and that really eats away at gains. 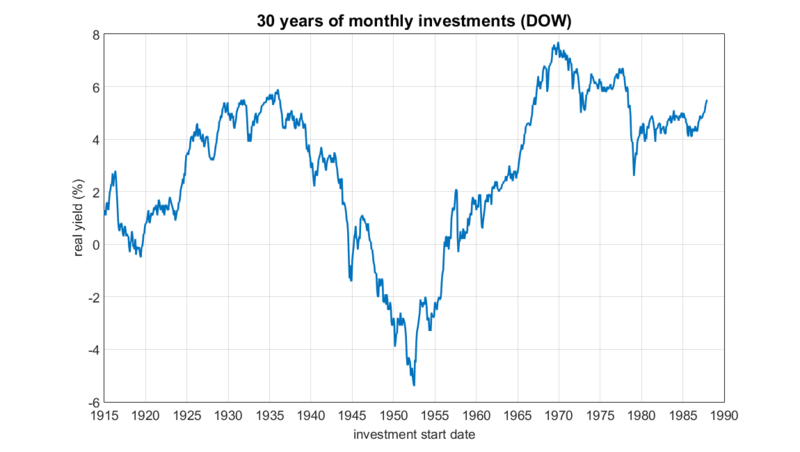 If you were born in the 1940's or 1950's so that your peak investing years were in the 70's - 90's, you really lucked out apparently. Other time periods seem very hit or miss. It's also pretty clear that my simple 'buy the dip' strategy doesn't really help or hurt...I experimented with a lot of different variants (need three consecutive months of 0.5% losses, auto-invest after 6 months of no dip, etc.) and could not find one that beat the simple $100/month strategy. I could not find a broader stock index with data going back this far, so I used the DJIA instead of something like the S&P 500. If you want to play with the algorithms, I've included my MATLAB code and the data here.